Step 1- Create new project say GoogleProfileDemo. Step 2- Add "Google play service" libray project. * consume the token but isn't integral to getting the tokens. onError("Following Error occured, please try again. " * recoverable then it displays the error message on parent activity. *             if communication with user info server failed. *             if the response from the server could not be parsed. * Reads the response from the input stream and returns it as a string. * it displays the error message on parent activity right away. // GooglePlayServices.apk is either old, disabled, or not present. // Unable to authenticate, but the user can fix this. // Forward the user to the appropriate activity. Can you upload test project to github? Sure dear today I will upload, please check after some time. i am not able to redirect on my app when i ist time rum my app with this code but second time am go to my second screen after successfull login,could you tell me what will be the prob? @jarnail please see this class-AbstractGetNameTask.java here we hit Google server for user authentication so if it is successes it give us code 200 and we redirect to next page but in case of 401 it did nothing so you can set any toast or alert dialog for try again. well still i did not able to get why Google did not give us response in first time. its working great in second attempt. Yes, its working great in second time. hey ..u r project is not running in my workspace...only loader is going? in first attempt sometime google did not give us image. so please try ones more time and see your log cat. it should work. It is tested demo and working for me, you can check screen shot. ohhh dear i got it.. where are you tested mobile phone or on emulator? please test it on mobile device. And yes one more thing please check have you sync any google account with your mobile phone or not..
and please check net connectivity too. how can i remove "view basic information about your account" button from screen. no no you can't this is google default page. you can't make any change normally. for first time when i integrate it it not shown any details like email ect. But after restarting an app it shows the data like email, gender. yes you are right. I am also surprise why not google give us 404 error means no data..
1)have you tried second time? 2)is your device sync with any Google account? 3)is internet is available there? if these things is okay it should work. and what about 1)have you tried second time? if everything okay it should work. if still you are facing issue please use debuger and let me know response from google server. Can u tell me how to save username and password into database by using account manager. Very Nice tutorial indeed.Have you figured out the reason of not getting details the first time we launch app and works fine the second time? There must be some reason to it.Kindly reply. still i did not check, i think this problem from google side not from developer. may be a new update available now on google please check for google update. i am new to android so please suggest me about the error..
i think you did not add google play store libray in your project. if it is not here please add it..
what error you are getting? same above error? please ones clean and rebuild your project. I am a beginner of few days...I am little confused,i am using oauth 2.0 ,there is no mentn of client id and client secret in your code where would i put my client id and secret do i put in the scope url or in the HttpConnection url plz help me out!!!! There is no need of oauth. It will work with all application. when I was publish this post i was using old play services version(API level-18) I don't know version name but now I am using new one with API level-22. Any issue here? Hello friend how can i get all email to select one to sync..
Hi Shanmuga, from where you want all email to sync? from your gmail account ? Here I am getting all list of account and used only 0th potion so you can put them in a list or popup for choose to user and then pass the selected potion. I always try to help to my followers but problem is that I have to do my work too parallel. So I can't write code for everyone for all problems. So do one thing just start with a demo project and try at your end. All demo's and code available on my blog and others blogger's blog just follow them. Like create a popup with list of google account etc. If you got stuck any point ask me know issue. Sure I will help you but not whole app any one do for you. Please don't mind but it is fact, a lot of people on my blog and they want I provide all code related to their project but please think from my place is it possible dear to write code for everyone? I know you are good in coding and you always read my all post and promote them but everyone have a limited time. Please don't think me wrong, I am your's friend and always here for help but thing is that just do some self effort if you face any problem I will try to short out. Sorry dear for late reply. You can give a log-out button inside your application and when user logout ones send him to out on main page and if again want login into app he have to press login button. And there is no option for logout session from app of google account in my knowledge. And I have never seen any app like this. Hello...u r project is not running . If we run this project splash screen is loading after few second application is forced close . what is problem? Can you please paste your log cat? Today I have run this project it is running . But profile image and date of birth is not display. What is problem? Your google account have set image and dob? It shows error while launching on my device..
can we get the click of ok button in google authentication alert view? i got the solution for the demo and i am going to put over here or on the any other opensource platform. you have any blog or source and tutorial for google plus or twitter for android...? please help me. Is there any way to Login with Google Account without use of Google Play Services library? No dear in my knowledge there is no way. Please check on google. May be they provide Google API's. Hey, It should work. May be in first time it will not work but in second time it should work. Please check log-cat is there any info or error? How can adapt your code to make it work for me? You can't use Android library and code in your phoneGap application. Better way use Java-Script or read Google doc. hiii can u tell how to get contact name and password of gmail. You can't dear. Google allow us to get only basic public info of any user. where you used client id in it. i am not able to find this in your code??? N case of google login just give a button for logout inside your app and finish all the activity and set flag clear top. You can redirect on login page again, this is the way in my knowladge. 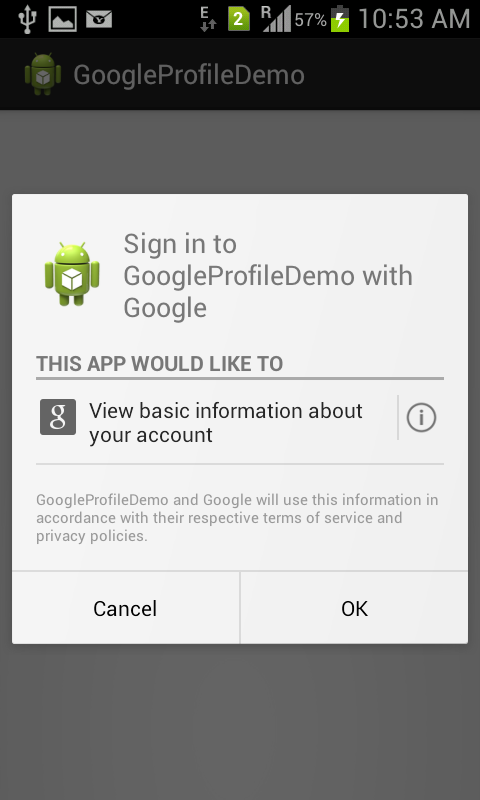 Or you need to sign off from android device from that google account. I've imported your project and when I run it in my phone or tablet it says "googleprofiledemo has stopped unexpectedly...". Do you know what's the problem? Can you please share your crash report? Hi manish, this code is force close on my sony xperia z phone. please help me. You need to use asynck task instead of direct ui thread. Thank you so much sir for gmail integration....I want to view my all gmail contacts in list view and block any of them by simply clicking on button...is this possible??? I think you can't, just Google provide some basic info like name,pic etc. Thanks its really helpful to get google profile. While fetching profile data not able to get birthday from json response. Birthday tag itself its not there in json response. i can't get birthday date. please help with me. Can you check the user detail on Google, is he set his birthday there or not? Anyway if there is any issue check the Google doc. I am not sure about this issue. hi manish u r project is not running only loader is going? Did you try in second attempt? getting "userRecoverableException" each time ! I can't say anything with out debug your code. BTW be sure your emulator/phone have Google account and play services? and if everything is fine then check updated Google document may be they changed the process to do things. Hi, i'm using your tutorial and i was just wondering. when you say I should be logged into my gmail, did you mean from a browser login in my mobile or it works with the gmail account installed from playstore? Please reply! Sorry for late reply, gmail login means login into you application using google account like you Facebook, Twitter login. 10-05 05:02:48.373 24699-24699/com.example.root.manishgoogle I/Adreno-EGL: Local Patches: a27ebf3082ec33cb1a482d04eecdc413bab8c375 Merge "Merge 86ebf3109226685a03c5fa4dcc28577bfa197568 on remote branch"
I don't know why but Google API have some bug and in first attempt they did not provide any data. Need check it again if Google have been updated their API. I used the following code for getting user information from Google plus, but it sometimes returns null fetchToken() . Please tell me what is wrong in this or suggest another code. Please check Google developer blog for updated code. how did i know the particular person login with my app. You will get the email-id of the person and you can match it with your database. you can't send email without user interaction because of user privacy. 04-07 20:11:53.282 10281-10281/com.example.venka.glogin E/GMPM: GoogleService failed to initialize, status: 10, Missing an expected resource: 'R.string.google_app_id' for initializing Google services. Possible causes are missing google-services.json or com.google.gms.google-services gradle plugin. 04-07 20:11:53.283 10281-10281/com.example.venka.glogin E/GMPM: Scheduler not set. Not logging error/warn. Hello sir im getting the splash screen with no googlesync toast and i had run this app on my nexus device.. so can u please provide me a solution about this? Are you using emulator or real device for testing? Is your phone have google account sync into your phone? its seem you are using emulator or your phone don't have any google account sync. Then you need to google or ask your question on stackoverflow may be someone had same issue.